SAN FRANCISCO – June 27, 2013 – PlayFirst Inc., a global leader in mobile games for family and friends, today announced Diner Dash Rush, the fastest DASH ever for iPhone, iPad and iPod touch. Diner Dash Rush serves up new fast-paced and competitive gameplay based on PlayFirst’s signature time-management design that has made Diner Dash a worldwide favorite for years. 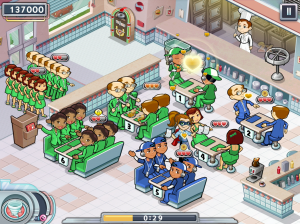 Keeping up with the rapid evolution of mobile technology in recent years, Flo, too, has continued to adapt and flourish, and Diner Dash Rush may just be her biggest leap yet. Although Flo’s got a new twinkle in her eye, her signature red sneaks and commitment to getting the job done – no matter what it takes – are here to stay. Through her past DASH adventures she became the confident entrepreneur she is today and she’s ready to take on the competition. 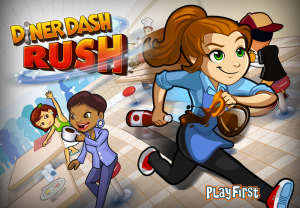 Diner Dash Rush sets the stage for Flo to roll up her sleeves anew and wow players with even more fleet-footed moves. Diner Dash Rush is built from a unique blend of classic and contemporary features. At its core is the DASH gameplay fans know and love, where success relies on combining strategies like color-matching, chaining and managing customer archetypes to create order out of chaos. Furthermore, Diner Dash Rush introduces brand new features to DASH that are sure to add an extra rush of excitement: timed rounds, weekly leaderboard tournaments and the all-new “Happy Hour” bonus round. By pleasing enough VIP customers to earn the right “Flair” during regular gameplay, players will advance to Happy Hour where the disco lights drop, the diner rocks out and players are granted extra time to rack up bonus points serving always-happy customers. These additional layers of speed, strategic depth and social competition have been folded into familiar DASH gameplay to make Diner Dash Rush lightning fast, furiously fun and a tremendous step forward for time management games. The Diner Dash Rush App is available for free from the App Store on iPhone, iPad and iPod touch or at www.AppStore.com/DinerDashRush. PlayFirst boasts over 10 million daily active users, and the DASH franchise, encompassing games like Diner Dash™, Cooking Dash™, Hotel Transylvania Dash™ and SpongeBob Diner Dash™, has garnered more than 700 million total downloads to date. At PlayFirst, we believe you can have fun anywhere, any time and at any age. That’s why we’re committed to creating mobile games for everyone to enjoy, including the fan-favorite DASH® series of games like Diner Dash® and SpongeBob Diner Dash® and character-driven games like Deep Sea Deli. Whether you’re in line at the store, on your lunch break or lounging at home, you only need a minute to dive into a PlayFirst game—but you’ll find a lifetime of entertainment. PlayFirst games are played by tens of millions of fans worldwide, and we’re just getting started. To find out more about our talented team and our awesome games, please visit www.playfirst.com. To download screenshots, character art, logos and more, click here! To view the trailer on YouTube, click here!